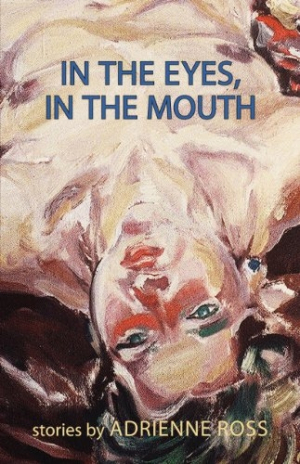 Eccentric personalities abound in Adrienne Ross’s debut short story collection, In the Eyes, In the Mouth. The title hints at what the writing shows—Ross doesn’t shy away from sensory details, but rather, she reveals who her characters are through their reactions to the world around them. Set in San Francisco and its surrounding boroughs, this collection tackles the beasts of love and loneliness, and the comfort that can be found in bizarre and unexpected ways. The stories overflow with the starkly human hopes, fears, and grievances people are too embarrassed to speak aloud, but can’t seem to stop from thinking. Ross has published a book of poetry, Twelve Winter Haiku, and poetic sensibility is alive and kicking in her fiction. She has an astute attention to detail, a gift for making the mundane delightful, and she does it all in service of bringing the reader deep into the character’s psyche. In “Getting Rid of Randall,” Polly goes about her daily life while musing upon the various ways in which she might injure, maim, or murder the selfish, demanding man with whom she and her teenaged sons live. Her strategies become increasingly inventive—from releasing mosquitoes into the cottage where he works, to putting ground glass in the biscotti dough—but only Polly and the reader remain privy to these secret notions. Intimacy with the main character is present, without exception, in every story. From the abandoned lover to the alcoholic, the lonely librarian to the pot-smoker, Ross’s characters are as diverse as their individual dilemmas, for which they devise a wide range of not always helpful solutions: some clean the house, and others let it fall into disarray. One starts talking to herself, while another seeks someone, however mediocre, to assuage her solitude. In “The Feather in Data’s Wing,” Reba decides, after much debating, to write a scathing letter to her ex-boyfriend, and says, “I walked out to the mailbox that very night, high on revenge and closure.” Ross has a knack for this type of description, a way of grounding the abstract and making it ring with absolute truth. Smart, witty, and utterly relatable, Ross’s stories are both fresh and familiar, with a subtle elegance that flows beneath the current of her words. There is something both pleasant and a bit disturbing about stories that brim with such honesty, and that keep you engaged from first page to last. This is the kind of writing that strikes a chord in the reader’s core, makes him sit up and pay attention, and perhaps even recognize himself in the pages.